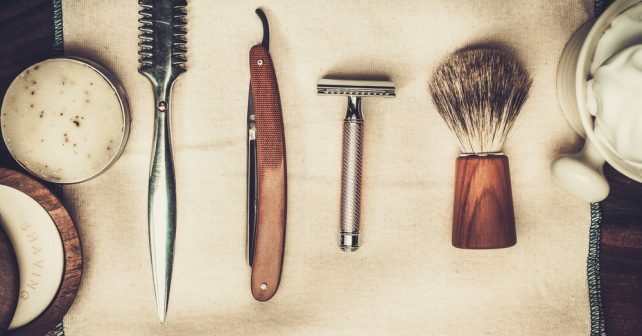 Many men take personal hygiene for granted. They have to constantly be told to floss, wear deodorant, or wash their hands after using the bathroom. If you have a good daily hygiene routine, it helps make you feel clean and fresh all day, and lowers your risk of various health problems. It also keeps your partner happy. Shower as often as possible. Do you go to the gym every morning? Before heading out to work, you should wash off all the sweat and grease all over your body by taking a shower. You do not want to reek on the bus or subway on your way to the office. That is just so inconsiderate to the other commuters. Imagine being the one who has to sit or stand next to a guy who smells and is soaked in his own perspiration, and you have nowhere else to go because it is rush hour and everyone is squashed in like sardines. Spend at least 10 minutes of your post-gym time to shower to clean up and smell good. 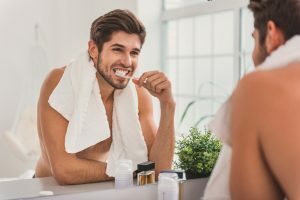 Dentists say that everyone should get into the habit of brushing their teeth after every meal or at least two times a day, and floss at least once a day. If you do these, you are protecting your teeth, gums, and tongue from collecting and growing bacteria that can cause tooth decay and gum disease. Use good quality toothbrush and dental floss to properly clean your teeth, something that can reach every nook and cranny. Failing to get rid of those food bits stuck between your teeth and gums will not only lead to bad teeth but also to bad breath. How are you going to make a good first impression to women if you turn them off the moment you open your mouth? Achieving clear and glowing skin can be difficult for a lot of men. Oftentimes, they just do not have the time or want to spend their time to stand in front of the mirror and apply a variety of skin care products in the morning before going to work and at night before going to bed. Unfortunately, you really have to invest time and effort in order to look radiant. Do some research on what the best facial care products for your skin type are. Look into using natural resources, like cucumber, papaya, and honey, for your daily skincare routine. Consulting a dermatologist is also encouraged. Learn to accept that getting rid of acne, tightening your pores, having clear complexion, and all that are more than just winning the skin genetics lottery. Every time you shake other people’s hands, do you wonder if they handled trash or sneezed into their hands just moments ago? Do you ever think if they always wash their hands after using the bathroom? One of the most common things that you may have noticed when using public restrooms is that not everyone washes their hands after. This is not good news, as germs and bacteria thrive in these types of places — from the toilets and sinks to the tissue dispensers and door knobs. This is also true for when you use the bathroom at home, your friend’s, and anyone’s. If you do not wash your hands with soap and water after doing your thing, you are going to pick up microbes and spread them everywhere just by touching. To avoid that, wash your hands by wetting them with clean, running water from the faucet, lathering them with soap, scrubbing them together for at least 20 seconds, and rinsing them with water. You can then dry them using a clean towel. Change into clean clothes regularly. Does the shirt that you wore yesterday still look clean and spotless? Are you thinking of wearing it again the next time you go out? Before doing that, you should give it a close sniff first. Worn clothes that appear to not have any visible blemishes or stains can give off a stinky odor that you may not notice but the other people may. Whether they are tops, pants, or socks, you should dump them into the laundry basket straight away if there is even a hint of a stench. Always wear freshly laundered wardrobe to not drive people away. Do you worry about how much you sweat? Does spending even a few minutes outdoors under the sun cause you to sweat buckets? Are you wondering why it seems like people do not want to get close to you? How do you deal with it if you cannot really take a shower or change your clothes multiple times a day? Some people are so unlucky to be profuse perspirers. Their clothes often manifest sweat stains in the armpit, back, and chest regions even without doing extremely physically demanding activities. And, they also often smell bad. If you are one of them, you should shop for deodorant that can keep you smelling nice and fresh during the day. Look for a brand that is also an antiperspirant to keep you cool and dry too. Why is it necessary to trim your fingernails and toenails, you ask? Well, have you torn a nail, infected a hangnail, or suffered from an ingrown toenail? Letting your nails grow long can be dangerous. It can lead to injuries that can be minor, which heals in less than a day, or major, which takes a month for the pain to subside. Why put yourself in that kind of situation where you have to deal with needless suffering and pain, when you only need a few minutes out of your entire week trimming your nails? With good quality nail clippers, you can maintain short and clean nails that can give your hands a tidy and healthy look.